There are two types of hardwood flooring, solid hardwood flooring and engineered hardwood flooring. Both are made up of 100% real wood. Both are offered with a factory finish or can be finished right at your home or place of business and both can be refinished. But that’s where the similarities end. When your salesperson talks about solid flooring they are referring to a 3/4 inch thick piece of solid wood. Although solid floors are available with a factory finish, they can also be finished on the job site. They can also be installed on or above grade, but not on a slab. The wood is generally nailed to a plywood subfloor. Solid floors may not perform well in areas of high humidity or areas with significant temperature changes. 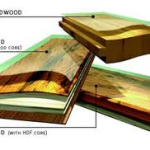 Because solid flooring is a 3⁄4-inchthick section of a tree, it responds to water and moisture as it would in nature. If the air is hot and humid, the floor will soak up that moisture, causing it to swell. When the air dries out, the floor will shrink, leaving gaps in between the boards. The wider the boards, the bigger the gaps and the more likely it will “cup,” so most solid wood floors are either 21⁄4 inches or 31⁄4 inches wide. For this reason, solid flooring is most common in areas with low humidity such as the Northeast and Midwest. You should like solid hardwood floors is because they are traditional and can be sanded many times. If they are finished at your home or business,they are relatively easy to sand and refinish. And it is possible to achieve a “true square edge” profile with a “sand and finish” floor. On the downside, if a solid wood floor is finished on site, it can be difficult to obtain a true color sample. In addition, installation can take a long time as each layer of finish must dry before the next coat is applied. construction to commercial building to industrial s look at the basics. A tree uses its roots to take water from the ground and deliver it to the leaves using straw like cells to move the water up the trunk. These cells get plumper when they are full of water and shrink when they are dry. Just as these cells change with moisture in a tree, they will also change with moisture within a floor. By stacking veneers with these cells facing in opposing directions, no one layer can grow or shrink too much in any direction. Because engineered floors can handle a certain amount of moisture from the subfloor, they can be installed anywhere in the house; on, above or below grade, on concrete or plywood subfloors with glue or nails or even by floating. Most engineered floors are finished at the factory, so they generally have aluminum oxide in the finish. Aluminum oxide is the hardest man made crystal in the world and therefore adds years to the finish warranty. As for sanding and refinishing, an engineered floor can be sanded about twice depending on the thickness of the wear layer. The aluminum oxide, however, makes it very difficult to actually sand off the finish.